Panned Review: Jordan Peele's "Us" is marred somewhat by a bizarre twist, but it’s still a first-rate scare picture. Jordan Peele's "Us" is marred somewhat by a bizarre twist, but it’s still a first-rate scare picture. In Us, the new shocker from writer-director Jordan Peele, the spaces of the film linger in our memories. If Peele has any tangible connection to the director John Carpenter (of the 1978 Halloween, Escape From New York, etc. ), it’s his effective use of familiar locations, which he transforms into hellscapes. Images of the leafy suburban houses of West Hollywood, as featured in the original Halloween, have rattled around in my psyche ever since I first saw that movie, and I can wander the streets of my own neighborhood and spot similar houses which conjure inside me a cozy sense of foreboding. The dwellings in Us are two mid-century lake houses that look like they might have been a vacation spot for the Brady Bunch what with their open stairwells and wood-paneled walls. And the other primary location is an oceanside amusement park in Santa Cruz (which, as the film is steeped in 1980s references, is surely a nod to the 1987 vampire film The Lost Boys). When the film opens, we’re met with a series of television commercials playing on an old boxed TV set (the year is 1986), which culminate in a feel-good, saccharine advertisement for “Hands Across America” (which took place on May 25, 1986). Moments later, we meet Addie, a young girl visiting the amusement park with her parents. Addie is draped in an oversized t-shirt emblazoned with the words, “Michael Jackson’s Thriller” on it. The shirt is a prize, won by her father moments ago at one of those shooting games. Addie wanders away from her parents, practically swimming in that Thriller shirt, and enters a dark funhouse called “Vision Quest”. (Its logo is, “Find Yourself”.) There she becomes lost in a maze of mirrors and seemingly infinite reflections of herself, one of which, it turns out, isn’t a reflection at all. We know that Addie fears returning to the lake house because it means returning also to the beach at Santa Cruz, and we know whatever Addie experienced in the funhouse has yet to be fully revealed to us. It left Addie temporarily mute as a child, and as an adult, Addie has kept quiet, never revealing the story to Gabriel, who is just trying to enjoy his vacation. Gabriel is more focused on playing with his new (old) boat and mingling with Josh and Katie (Tim Heidecker and Elisabeth Moss), fellow vacationers who have a pair of inane teenage daughters. As the boozing, bored Katie, Elisabeth Moss lends some flair to a small role: Josh pours Katie a third glass of rosé (he’s quick to point out the number in the presence of Addie), and says, “here’s your medicine,” and Katie responds with a jokingly hostile indifference that perfectly sums up their relationship. Indeed, Katie’s general response, in body language and in tone of voice, is the equivalent of the world’s longest eye roll. Addie suffers through this performative marital spat as the lone spectator; when Katie invites her into some wifey small talk, Addie feels unequal to the task. The pace of the film never relents after the initial attack, when we realize that these are not the only doubles who’ve been unleashed, seemingly by Addie (for reasons unclear to us). But the film is somewhat marred by a complicated plot twist, and its refusal to give away too much too soon means that our horror is tinged with confusion: we’re aghast by the freakish goings on, but constantly aware of our confusion. Peele doesn’t deny us an explanation, and the movie avoids the problem of Hereditary director Ari Aster, who went in too many different directions, but Us is nevertheless vaguely unsatisfying if you think about it too much. The doubles themselves are loaded with symbolism, but the more you contemplate their actual origin, the less it makes sense. That’s why I recommend not parsing out the details. (Perhaps Peele should have left them out to begin with.) As a movie-going experience, Us is unhinged and pleasurably terrifying (and funny) in the way a horror movie should be. If the big themes underneath are mushy and unsatisfying, at least Peele gets a good deal right in terms of tone and construction. Ultimately, the performances of the actors playing the Wilson family make the movie work, because they make it human. Peele needs this, especially when his dizzying plot twist fails him. 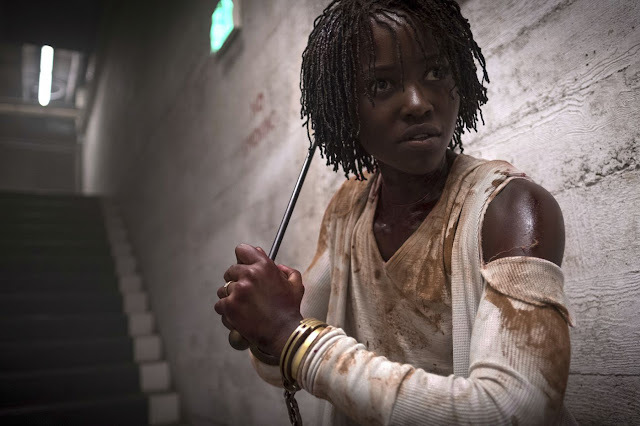 Even at Addie’s most monstrous moments, Lupita Nyong’o keeps her from becoming an actual monster; she remains maternal and strong and single-minded as she’s forced to commit horrifying acts of violence in order to protect her family. In a scene at one of the lake houses, Jason witnesses his mother bashing in a double’s skull (the gore is, mercifully, left to our imagination), but Addie somehow returns to normal, wanting her son to see her as his mother and not the Terminator. Shahadi Wright, as Zora, and Evan Alex, as Jason, have together redeemed every child who has ever been a source of annoyance in a scary movie. (I’m thinking, in particular, of the irritating kids in Jurassic Park.) Zora and Jason fight back, take chances, use their brains, in ways that few adults do in most horror movies. They’re also remarkably game, and adept at developing fully realized characters, sometimes with just a facial expression or a gesture. Wright gets the sarcastic, “what the hell” look of a teenage girl down perfectly, and Alex, whose character is rather complex (he has a special bond with his mother, as though he’s more likely than Zora to connect with all things metaphysical), is required to be quiet and pensive, yet he makes us care about him, laugh with him, and root for him, as he outwits his own double in multiple scenes. And, as Gabriel, Winston Duke, the film’s comedy MVP, serves as a vector for Jordan Peele’s love of dumb humor. He cracks dad jokes and skulls in equal measure.